For the average taxpayer, the general excise tax is a constant conundrum. It is a relatively simple tax, but in other respects, it isn’t. Many taxpayers who have lived on the mainland and many who were born and raised in Hawaii seem to believe that the general excise tax is just like the sales taxes found on the mainland. But it isn’t! As a result of perceiving it as a sales tax, many taxpayers constantly ask why they are charged a rate of 4.166% instead of just the plain old 4% that is stated in the law? Isn’t it illegal for businesses to charge more than the 4% rate? 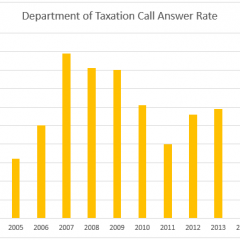 Doesn’t the tax department monitor and fine people who charge more than the statutory rate? While it is not that the tax department doesn’t care what businesses pass on to their customers, the department is only concerned that it gets 4% of whatever goes into the cash drawer of the business. In fact, there is no provision in the law that the business must visibly show that the general excise tax is being passed on to the purchaser. On the other hand, there is a provision in the law that prohibits the business from telling customers that the general excise tax is not a part of the price or that the tax is not being charged on that purchase. So where does this “.166” come into play? That “.166” is the business’ attempt to recover as much of the taxes he or she has to pay to the state as possible. Because the general excise tax is a tax on gross income, the amount of the tax that the business passes on to the customer goes into the cash drawer along with the shelf price of the goods or services and becomes a part of the gross income upon which the 4% is due. Say the price of a coat is $100. The business rings up the sale as $100 plus four percent of $100 or $4. So the business collects $104 from the customer and puts it in the cash drawer. When the business owner figures out what he owes in general excise taxes, he multiplies 4% times the $104 in the cash drawer. The general excise tax bill is actually $4.16, as the business must pay 4% on the $4 that was passed on to the customer as the general excise tax. While sixteen cents sounds like peanuts, on millions of dollars of gross revenues it can add up to some real money. On a million-dollar sale, that is $1,600 that comes out of the business’ profit if the “.166” is not tacked on to the 4% rate. If the business tacks on the “.166,” the general excise that would actually be due on that million-dollar sale would come to $41,664 with only $64 coming out of the business’ profit margin. In the earliest days of the general excise most, if not all, businesses did not show out the tax separately. What you saw on the shelf or on the sales tag is what you paid. It was only when the federal income tax law was amended in the mid-1950’s to allow the deduction of state sales taxes did this practice change. Merchants in Hawaii sought the IRS’ approval to recognize Hawaii’s general excise tax as a sales tax for the purpose of being allowed to deduct the amount as a sales tax. The IRS agreed to allow the deduction of the general excise tax provided it was shown out separately. Passing on the additional amount that has to be paid on the amount passed on as the general excise tax exacerbates the cost of everything purchased in Hawaii. Thus, when the 0.5% surcharge goes into effect for Honolulu next year, the amount of the pass-on will increase from 4.166% to 4.7%. Although the amount generated by the 0.5% rate is earmarked for Honolulu’s mass transit project, the state will not only share in 10% of those collections, as provided for by Act 247, but it will also benefit from the windfall of the additional amount collected by businesses trying to recover as much of the cost of the tax as they can. And unlike a sales tax, the business is liable for the tax. It is a tax on the business’ gross income for the privilege of doing business in Hawaii whereas the retail sales tax found on the mainland is a tax on the customer. In the case of the retail sales tax, the business or seller of the goods is merely acting as a collection agent for the state or county government that imposes the sales tax. In some cases, businesses are actually reimbursed for the cost of collecting the state and local sales tax. But that is not the case in Hawaii. Businesses bear the additional cost of collecting and accounting for the general excise tax. And with the complexity of dealing with the surcharge that cost will climb and will be passed on to consumers. Did DOTAX Turn the Corner on Customer Service?